For the cadets and student PIs of Gloucestershire College’s Army Cadet Force Company, the end of May is the highlight of the year. Over the past 5 years, this has become the time for the traditional year-ending expedition to the Pyrenees in the south of France. This is a 12-day expedition providing the culmination of 2 years of study for the cadets who are all students on the Extended Diploma in Uniformed Public Services. It gives these young adults the chance to travel overseas, some for the first time in their lives, and participate in a range of adventurous activities including their Duke of Ediniburgh Silver and, this year for the first time, Gold Award expeditions. This year saw 18 students attend the trip of which 14 were cadets within Gloucestershire Army Cadet Force and 4 were “student PIs” – classmates of the cadets at college that are now too old to be cadets but who continue to work with the cadets as assistant instructors. 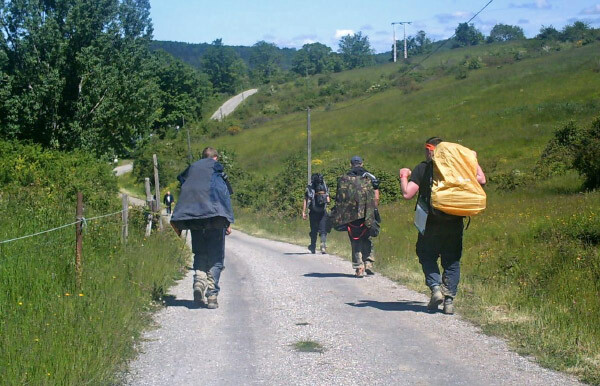 After travelling for two long days by minibus, transit van and ferry to the base camp at Lac de Montbel in the Ariège Department of the Midi-Pyrénées region of South France, the cadets prepared to set up camp. Unlike previous years when the weather had been generally hot and sunny, spring in the Pyrenees had been very wet in 2013 and consequently large areas of the base camp were waterlogged and unsuitable for camping. The first challenge was, therefore, to find an area of the campground that the cadets could pitch their tents on and another that could be utilised as an administration area. Once this was done, it was quickly realised that there was nowhere suitable for the staff tents except the children’s playground so the staff ended up pitching tents in and around the slides and swings…! These conditions proved to be the theme of the expedition with the staff and cadets experiencing the worst weather conditions on this trip in the 5 years it has been run. Whilst this is usually a trip conducted in 30 degree temperatures, this year there was one day of sun and that was the final training day before starting the two day journey back to the UK! As with previous years, the 8 days in country were structured by a training programme that included 3 days on expedition for Duke of Edinburgh, 2 days of kayaking, 1 day of mountain biking, 1 day of canyoning and a day comprised of rock climbing and a visit to a local historical town for rest and recuperation. This year there was a slight difference with the Duke of Edinburgh phase of the expedition as one group, for the first time in the history of this exercise, completed the Gold Award expedition instead of the Silver. Using the same basic route outline as the Silver expedition groups, the Gold group added in an extra campsite and day of walking/project to their route and, by walking during the day that would have been their “rest” day, the four participants completed the Gold expedition and are now finishing off the last few elements of their Gold Awards. 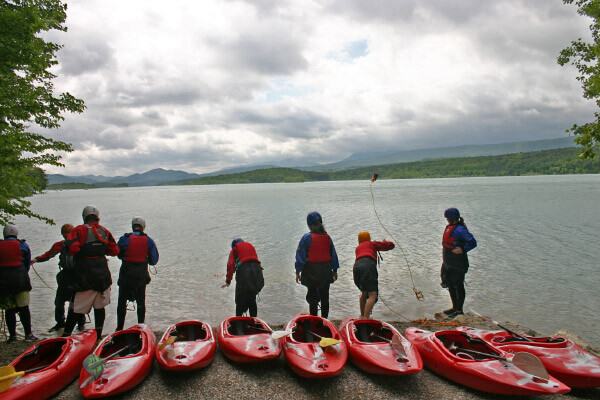 This year, the kayaking programme was tweaked slightly though was still conducted in two different locations. The first day, held on Lac de Montbelwas, was used for the cadets to demonstrate their skills before heading out on the river the next day and also for the to complete the Foundation Safety and Rescue course. 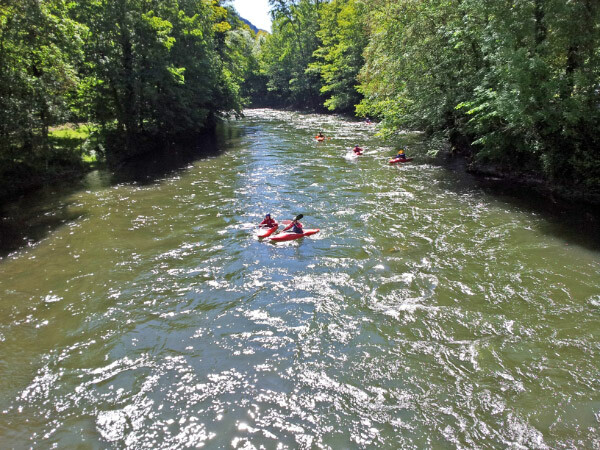 The second day saw them taking a river expedition on the local Ariege river which involved some white water kayaking on Grade 2 rapids. Mountain biking was also tweaked again this year to make it more straightforward to administer logistically with the routes starting and ending at the lake. 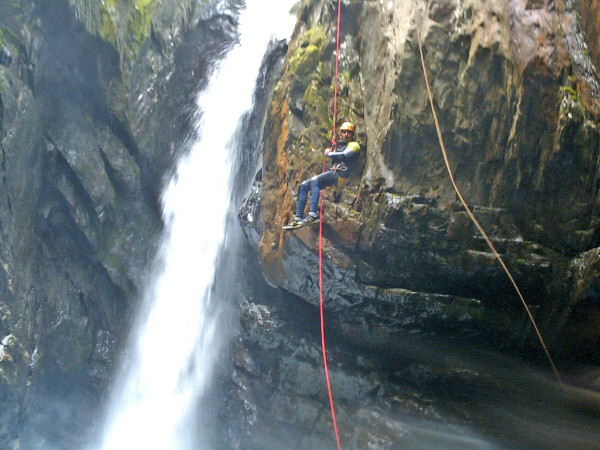 As usual, and despite the weather, the canyoning day was the most popular day of the trip for both the students and the staff and involved a morning of abseil training in the local Marc valley followed by a half day trip down a nearby canyon. The final day of the training programme saw the students spend the morning rock climbing on a slab situated on a disused railway line a few kilometres from base camp. This allowed them to practise skills they had developed during their training in the Forest of Dean in March and April. They then had the opportunity to explore the nearby historical town of Mirepoix and its famous medieval city square. This exercise is always a test of the character and resolve of the cadets and pushes them up to and past their limits. This year, the weather made it even more of a challenge, both with regards to the conditions experienced on the activities and also the constant rain and mud back in base camp. 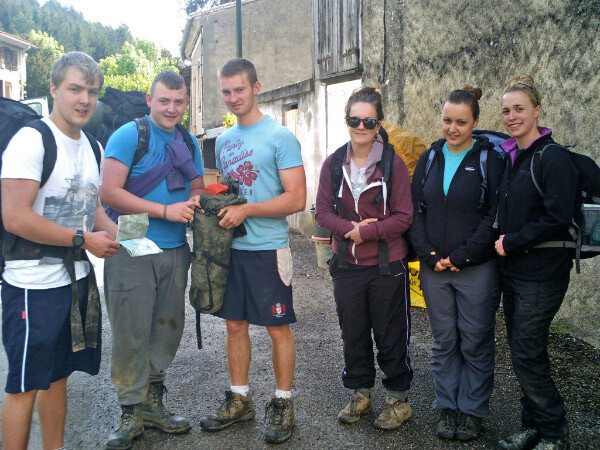 There were several personal triumphs from the cadets including the four cadets who completed the Gold Duke of Edinburgh expedition – Cdt Sjt Elliot Winters, Cdt Sjt Steve Mascarenhas, Cdt Sjt Zach Reid and Cdt Cpl Elliot Trigg –as well as Cdt L/Cpl Jasmyn Barry who completed the mountain biking and canyoning activities despite a fear of cycling, heights and water! Suffice to say, Cdt L/Cpl Barry received a lot of support from the other cadets in her group and pushed through what can only be described as abject terror to complete the activities! Overall the trip was a great success with all 17 of the 18 participants successfully completing the Duke of Edinburgh Expedition and all 18 completing the rest of the activities. The cadets and organisers are extremely grateful for the generous donation from the Ulysses Trust which contributed to making the expedition accessible to cadets who would not otherwise have had the opportunity to participate.